Project obstacles and solutions: Miami University in Oxford, Ohio is in the midst of a renovation project to upgrade their East Quad dorms and other facilities. This has included gutting several student residential buildings and razing/replacing others. 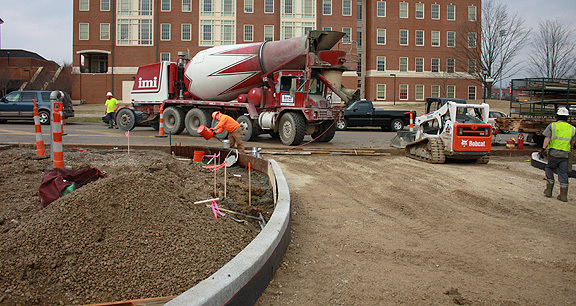 Messer Construction was hired as the general contractor for the East Quad renovations and Metcon did all of the hardscape concrete work. Key to the building process in the East Quad was the construction of the new Garden Commons Dining Hall. It replaced an aging dining hall in the East Quad. With renovated dorms on schedule to open in July, the dining hall had to be operational, which included the delivery of heavy equipment. Critical to all of this was the construction of a loading dock. The dock was scheduled to be constructed over the university's spring break in mid-March. To make sure the delivery of equipment was to stay on schedule, the 10 inch loading bays had to make a strength of 4,000 psi in just three days. Delivery trucks were scheduled to be unloading at the docks three days after the pour. To complicate things, rain was being forecast off and on throughout the week. The morning of the pour, the weather broke and the contractor had a few hours to pour and finish the bays. IMI was able to take the order and deliver the concrete on time. IMI QC/QA worked with Messer and Metcon to design a concrete mix that would achieve early strength gain to meet the 4,000/three day requirement. The concrete was mixed with a high range water reducer to keep the water-to-cement ratio low. Metcon used a laser screed with a 3-D GPS system to quickly level the concrete and keep their crews moving. IMI took into account the depth of the slab-on-grade and adjusted cementitous materials to help accelerate the curing process. Slump and air entrainment levels were crucial to the performance of the concrete. Each load of concrete was tested on-site for slump and air. At the end of the day, Metcon was able to finish the loading dock bays ahead of the rain. The concrete met strength requirements and the dock was opened for heavy traffic within 72 hours of the pour.